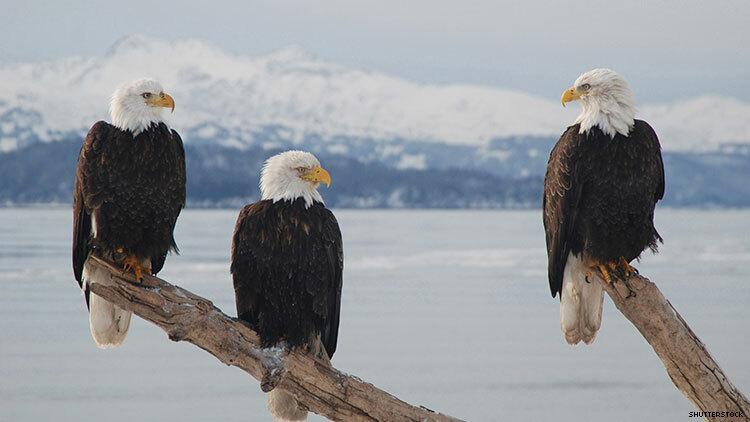 A rare trio of bald eagles is being celebrated for showing the beauty of nontraditional families in nature. Two males — Valor I and Valor II — are sharing a nest with a female, Starr, reports USA Today. Together, they helped incubate and hatch their second round of eggs. Three eggs hatched in March and the eaglets are expected to fledge and leave the nest in the coming weeks. The paternity of the chicks is not known since both Valors have mated with Starr. Like any family, the history of these eagles is complicated. The nest was originally inhabited by Valor I and another female eagle named Hope. Initially, Valor I had poor parenting skills — he didn’t hunt or guard the nest while Hope was away. Valor II entered the nest in 2013 to pick up the slack — and taught Valor I some parenting skills in the process. Hope left the nest in March 2017 after she was injured by other birds. But instead of going off to find new mates, the male eagles decided to stick together until Starr joined their nest in September 2017. The family also experienced tragedy. Starr initially laid two eggs in September 2018. While one of the eaglets was able to leave the nest, the other died of unknown causes. The trio’s joys and dramas, which include attacks and courageous acts of parenting, are streamed live on YouTube through a camera from the Stewards of the Upper Mississippi River Refuge. The environmental nonprofit requests donations to help maintain this service. Watch the trio of eagles below.